Amongst our favourite local traditions, the National Day fireworks display tops the list. Nothing quite fills our hearts with pride like watching the city light up in a spectacular explosion of colours over the skyline. Naturally, an occasion so majestic calls for killer seats. Lucky for you, we’ve handpicked our favourite spots with unparalleled views of the pyrotechnics display. The festivities will be in full swing at Cé La Vi for Singapore’s biggest night, with the restaurant offering a special menu — highlights include Nyonya Spiced Rack of Lamb with Roasted Chili Jam and Pecan and Caramel Petit Gâteau — and the lounge throwing its annual Majulah National Day Fiesta of traditional childhood games. Staying past the fireworks display? You’ll be duly rewarded with panoramic views, upbeat tunes and cocktails by its resident mixologists. Perched 57 floors above ground at Marina Bay Sands is Lavo: An Italian-American restaurant that prides “vibe-dining”. It’s all about the feel-good factor — as you tuck into the restaurant’s menu of classic, yet refined plates, pulsating, electric beats reverberating from the DJ booth accompanies your meal. Once you’ve wrapped up your meal, order a cocktail and head to the outdoor terrace for a 180-degree view of the light show. The classic American restaurant proves you don’t need a bird’s eye view to enjoy the fireworks with its waterfront view of the fireworks. Serving up Southern favourites such as St Louis Style pork ribs and the Lobster Mac and (five) Cheese, the restaurant will usher in the nation’s 53rd birthday with a bang, with live music and speciality cocktails such as the Blackberry Bourbon Lemonade. Over at One Fullerton, The Pelican Seafood Bar and Grill draws inspiration from the glamorous era of sea travel with its curious mix of decor accents — think oversized acrylic seahorse art in hot pink, giant hourglasses and tear-drop vintage globes. Step through its enormous copper glass doors and take a seat at the cushy leather booth in the main dining room. Its East Coast American menu gets a special upgrade this National Day with a four-course dinner menu, as well as a sharing menu for six which includes a seafood platter, two bottles of Joseph Perrier Brut champagne as well as Belvedere Vodka. 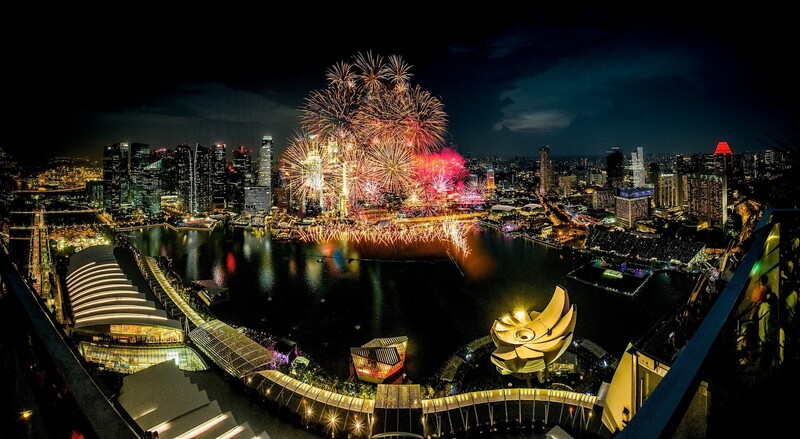 Step outside to see the dazzling display against the Marina Bay waterfront. Of Singapore’s many rooftop bars, Lantern at The Fullerton Bay Hotel Singapore delivers some of the best views of the cityscape. Named after Clifford Pier’s historical name of Red Lantern Pier, the bar plays ambient house music all night and has a stylish infinity pool. Make a reservation before 8pm to catch the light show from the comforts of your seat. For an exclusive firework-viewing experience, make a booking for Jaan’s private dining room. Perched on the 70th floor of Swissotel the Stamford, the modern British Michelin-starred restaurant is unendingly chic, with a cream colour palette as an understated complement to the Murano crystal and silver free-form chandelier that spans the entire ceiling. The seasonal menu – created with only fresh ingredient from the world’s best gourmet producers – is best enjoyed with a glass of wine from the restaurant’s exceptional range. There’s no better way to toast to the nation’s birthday. Fireworks, great music and an A-list crowd at the highest alfresco bar in the world — could there be a more glamorous way to celebrate the nation’s birthday? To bag a front row seat of the light show, swing by at sundown for a drink, then work your way through light bites and platters as you wait for the display. Skip the crowds at Marina Bay and head instead to Smoke & Mirrors: A rooftop bar atop National Gallery Singapore. Revered for its menu of imaginative cocktails, the space boasts a sculptural bar, and a poised atmosphere bolstered by its furnishings of warm wood, copper tones and warm lighting. Make your reservations now — the restaurant already has a rooftop dinner soiree planned, complete with a buffet of local delights, as well as free-flow sparkling wine, gin and tonic and Singapore Sling. Skip the crowds at Marina Bay and watch the fireworks display from refined restaurant Artemis Grill, located on the 40th floor of CapitaGreen. Floor-to-ceiling windows treat diners with unrivalled, killer views of the skyline. While clean, flavourful Mediterranean cuisine is its theme, the restaurant is capable of catering to different food preferences and types thanks to its diverse team from more than ten countries.